Just asking if this is a table of interest? If so I'll include it occasionally. 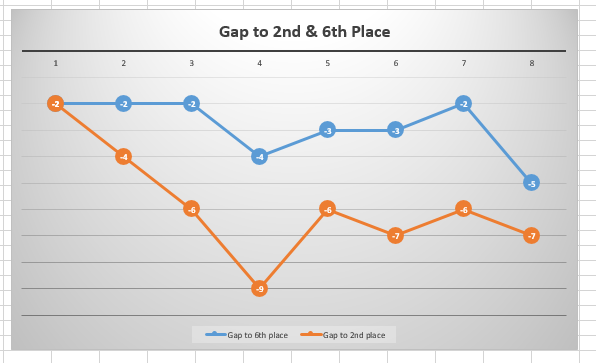 Points this season compared to last position wise. I'd be interested for sure. 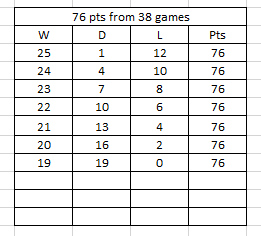 Mike the stat's are always interesting, look at our team who decide our new signings (lol), it would be interesting (but too time consuming) to see a table of possession stat's, shots on and off target and points gained, not sure though on what basis you would decide how to rate the sides? 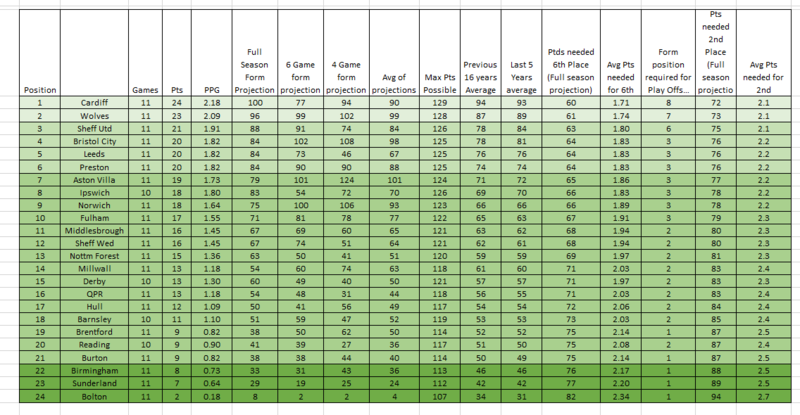 At the start of the season I set my self a target of not checking the league table until 1 October, after game week 11 and/or your (fantastic & much appreciated) stats updates. At this time I had hoped we would have 22 points and be, at least, in the top 6. Ok. Whilst not looking at results and tables I have picked up unavoidable snippets. Cardiff, Leeds, Sheff Utd and Preston doing well. Bolton in dire straights. Harry being sacked meaning Birmingham must be struggling. But I have looked at the table and stats for the first time today. Reading struggling does not surprise me. Brentford does. Bristol City are having another good start as they did last season. Ipswich higher than I expected. Cardiff, Preston or Sheffield Utd, this years Huddersfield? Wednesday winning today puts them in the mix with us and keeps Leeds in touching distance. 10th with 17 points in 2017/18. 3 points off the playoffs and 6/7 points off the top 2. That is 3 points and 4 places better than last season. 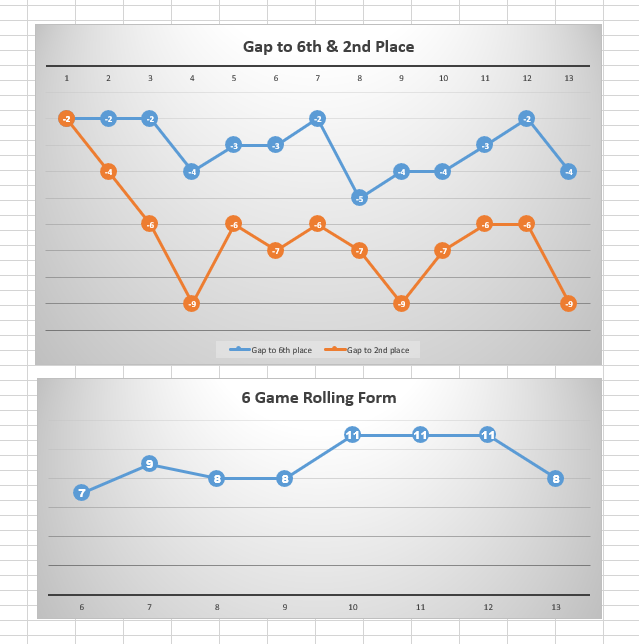 The gap to the playoffs last season was 6 points and 9/11 to the top 2. So. Not quite where I hoped we would be but an improvement. Interesting to note that at this stage last season Huddersfield (1), Toon (3) & Brighton (4) occupied 3 of the top 4 places. Norwich (2) dropped away. Form table (6 games) shows us 8th. Our next opponents? 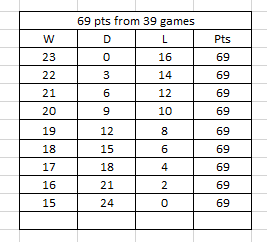 Stats wise that is a tough sequence of games against form teams. Bar Bolton who I hope will not be another Burton.. Since beating us their next two home games were both 0-4 defeats against Villa & Wolves. Our home form puts us 20th. Away we are 2nd. Clearly 3x home wins have to be the target. If you offered me 10 points in the next sequence now I would take it. We achieved that last year (w3, d1, l1) and rose to 7th. 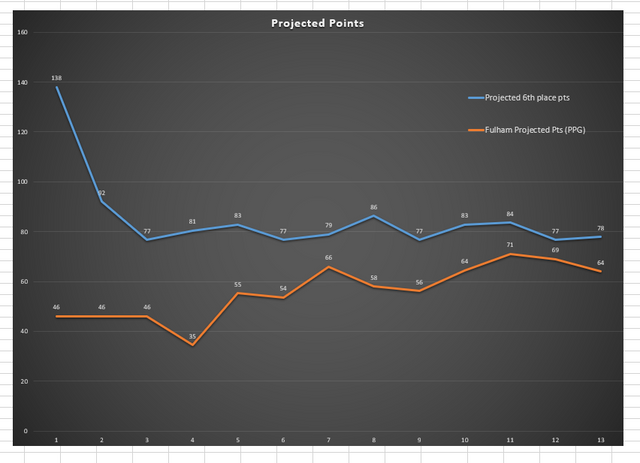 I think we need to be aiming to take 2 points per game if we want to challenge for automatic promotion come May. Soon we start that the better. Of course it will never be that simple and more of a rollercoaster ride. 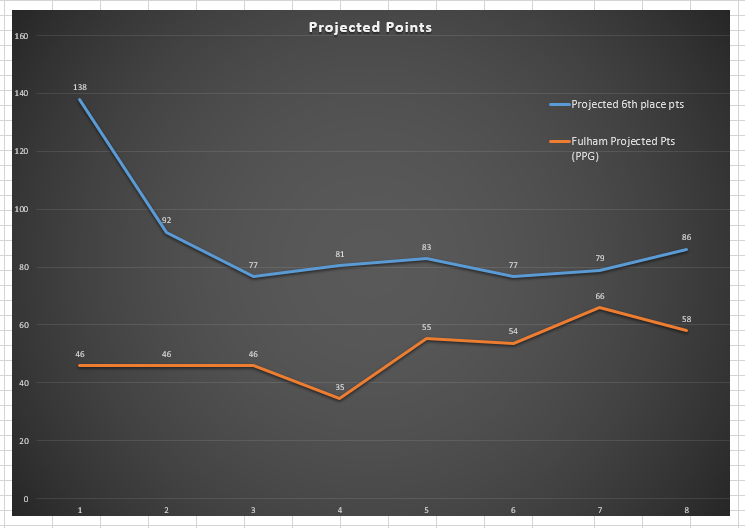 Fulhamish would be to beat Villa and/or Wolves and lose to Bolton. Time for us to find our stride. Be composed in front of goal to take our chances and/or composed at the back in keeping a clean sheet or 3 to see games out. Hope for the international break? Those away come back injury free, those at Motspur Park are fully fit for Preston so that Joka has as close to a fully fit squad to chose from. Thanks for all that. When we hit our stride in second half of last season our 6 game form was in the 11-14 game region with a couple of dips here and there. 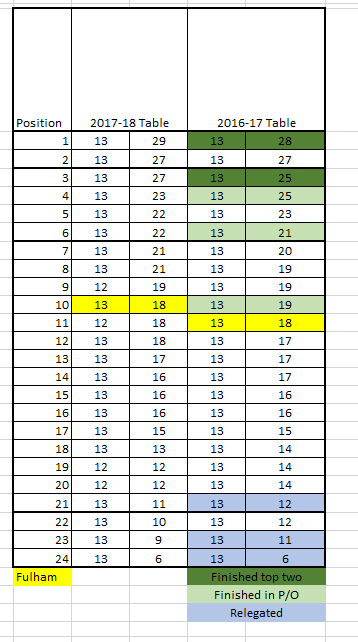 12 from 6 is the lowest we should be averaging if we want to be in the top 2 and even then it might not be enough. So for me its still 3rd or 4th as a finish I reckon, but still a lot of games to play and table has not settled down yet. another 4 games and we will be at 15 games which is my real benchmark for how the league will start sorting itself out. 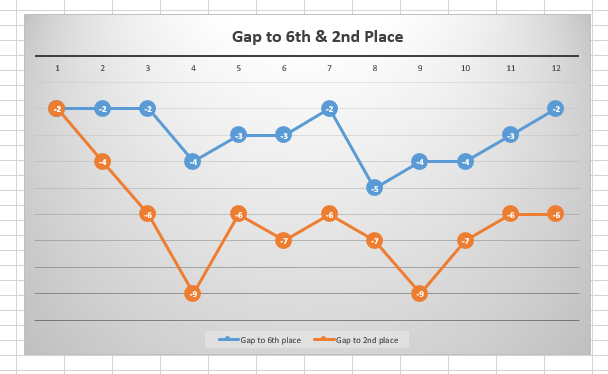 Also one target is not to allow gaps to get to more than 6 points. 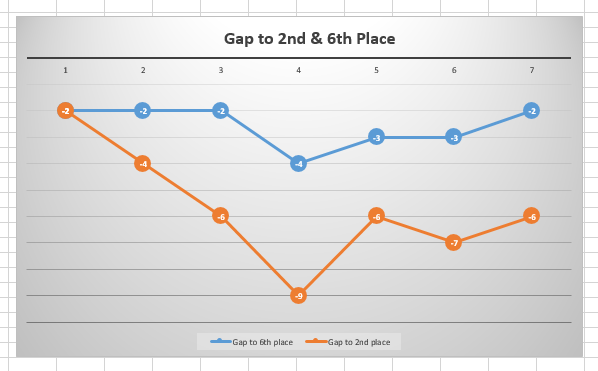 It would take us about 6 or 7 wins in a row to close that kind of gap the way things are going now. 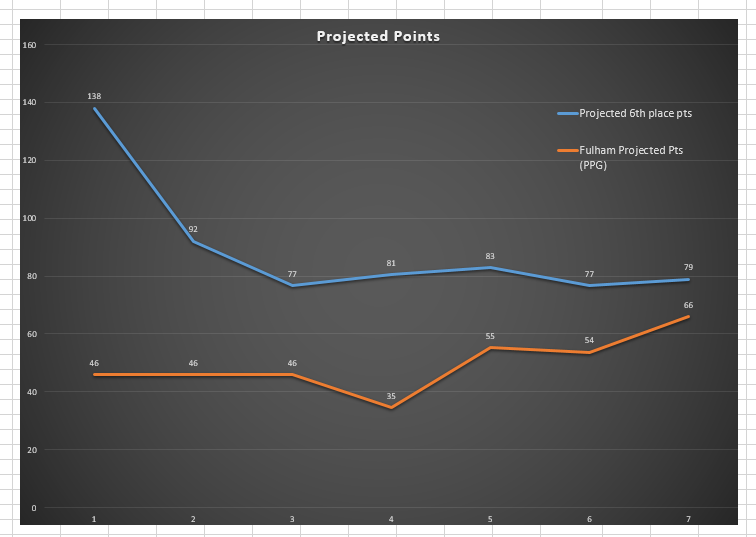 I do get asked and told that projections mean nothing and to a point thats true and there is an error rate for sure. 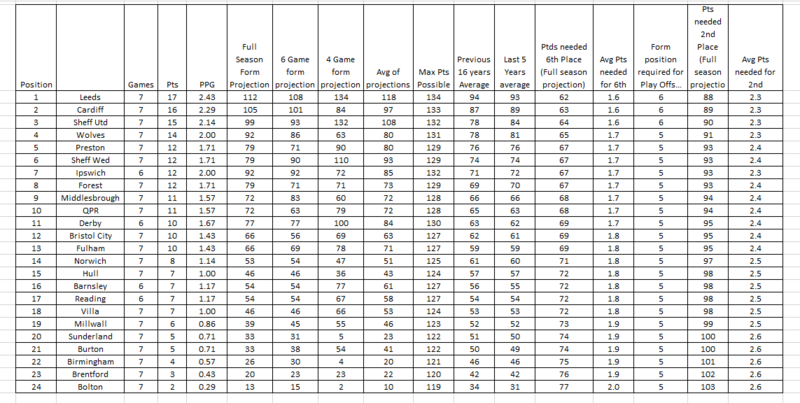 Here is the table and projections at this stage last season. 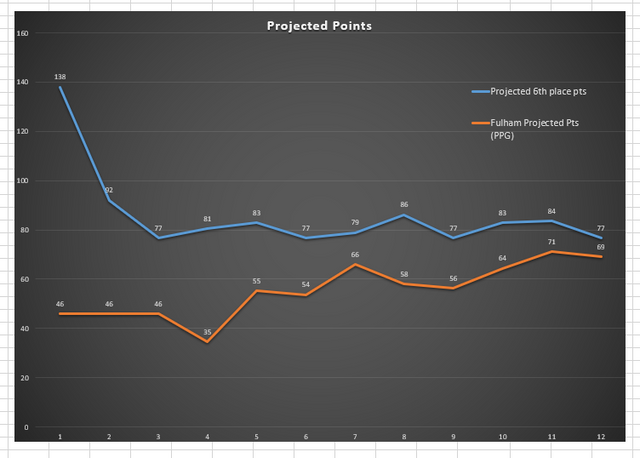 Yes there are some variences but out of 24 positions 18 were within a plus or minus of 3 pts from what was projected. 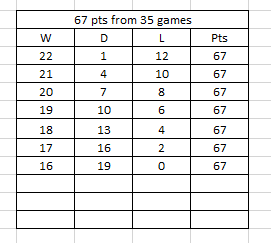 This was the top 6 from 14 games onwards last seaqson. We just basically need to do the same. So we are currently averaging one and a half points a game. Probably not enough to reach the top 6. The thing is, we need to emulate last season late run of form and results. With the uncertainty of Tom Cairneys injury coupled with our failure to score as freely as last season, and the concern over a fragile defence that rarely finds a clean sheet. Not forgetting that teams have found us out, and are now able to counter our system of play. To compound the situation, our home form is mediocre, and that is a huge concern. Not forgetting an injury list that doesn’t seem shrink at the moment. Then surgery needs to be done in the January Window, quality players, not free transfers, and that will cost money, so Khan had better unwind the barbed wire round his fat wallet, and Jok should stop wasting Sess at full back, and bring in this left back from Portugal who somebody signed back in August when the guy was injured, and is now employed polishing the bench. We need reinforcements to strengthen the weaknesses in defence, midfield and attack. Not enough quality, resiliance or leadership in the team. That’s why we have only won 4 out of 13, and 1 win in 6 Home matches, that’s a poor return. Yes we are only 4 points off the top 6, which is the only Oasis in a Desert of sand. So there is still time to bring in the reinforcements we need, but they need to be good enough to go straight in the team and make an impact, not hang around the bench or wander around the medical room like so many new additions do. A lot of this is about showing how you can make up ground over a long period. Now we are back at 4 points. 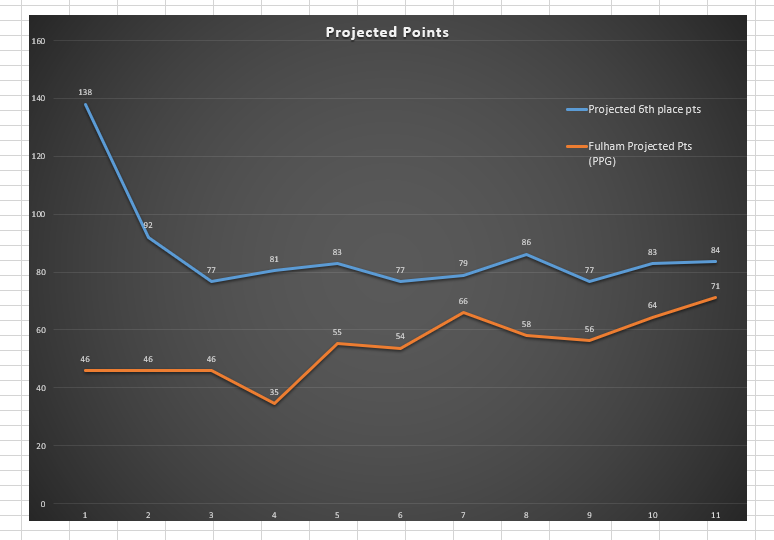 At game 16 if we can be 1 point behind then we may drop back again. Its inch by inch sometimes to reach that goal and there will be bumps in the road and you have to just deal with them and not lose our poo when it happens. We are not form wise showing top 6 yet and we are in right place for how we have played. 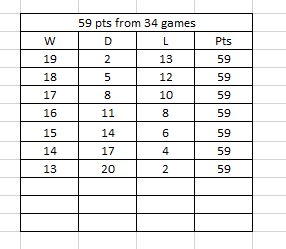 But as one table shows we have had a harder start than last season, so maybe just maybe we are ahead of the game compared to last year. Not by a lot, but possibly in better position than at same stage last year. I do still believe we have a top six squad. 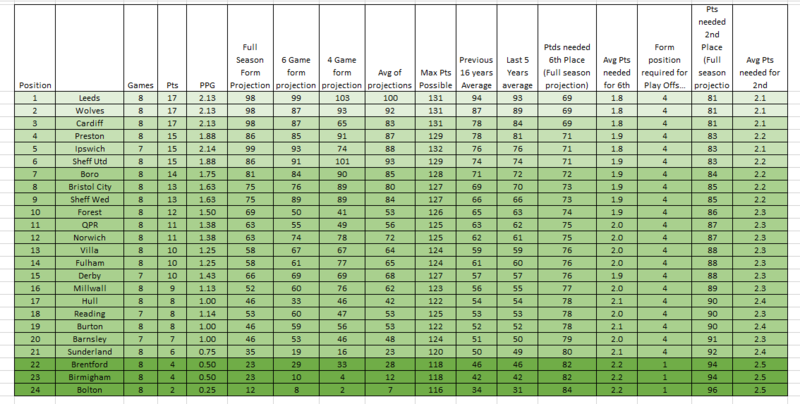 I predicted 4th and while we might not end up there any playoff position is a gamble as such really. 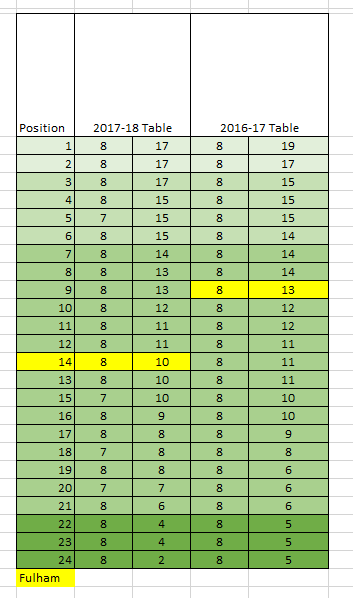 Saying all that we are getting to the point where I always say the table is the table and it wont change much. 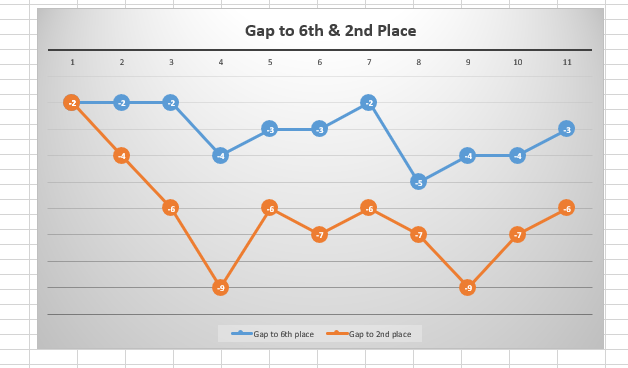 Also we cant allow a gap of more than 6 points to build. At halfway point last year we were 4 behind 6th and had to be best team in league for next 23 games. Even I dont see us being able to do that again two years in a row. Thanks for this sensible, rational and balanced info and accompanying comments. Very useful.